It was a gloomy day, and the ultimate comfort food was going to be the only thing to get me out of this slump. That’s when I decided to create the ultimate Gourmet Mac & Cheese with a 4 cheese blend (Sharp Cheddar, Brie, Gruyere and Asiago) and pancetta, topped with a weave of bacon! Preheat oven to 375°F. Cook macaroni as directed on packaging. Melt butter in large saucepan over medium heat. Add flour and stir until mixture turns golden brown, about 4 minutes. Add thyme, onion powder, paprika and nutmeg and gradually whisk in milk. Simmer until thickened and smooth, stirring often, about 4 minutes. Add cheeses and stir until melted and smooth. Add the pancetta and cooked macaroni and mix until well coated. Taste and season accordingly. Place pasta mixture into an oven safe dish. 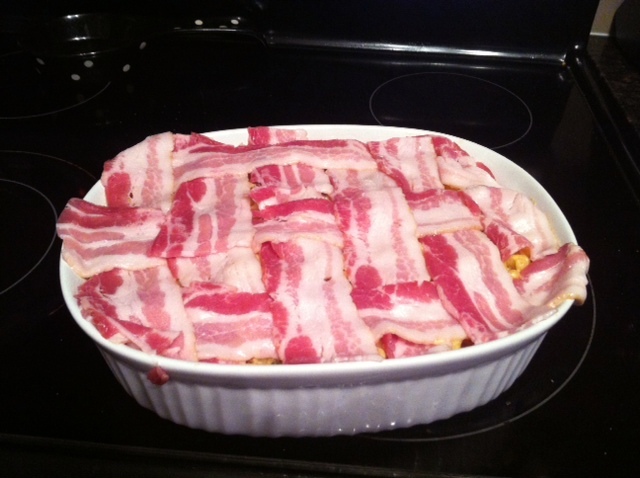 Weave a bacon top layer over the dish and cook for 20 minutes – until bacon is cooked and crisp. 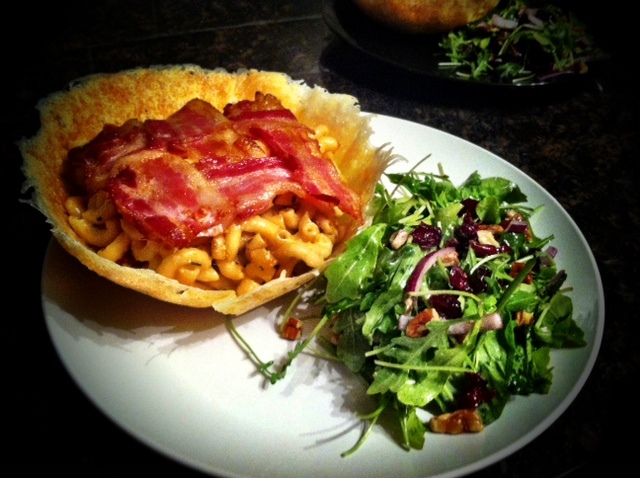 I served my Gourmet Mac & Cheese in a Parmesan Cheese Bowl with a mixed green salad.